Dare to be different. As does Diesel. This funky, gleaming Double Down S44 white bracelet watch makes the perfect gift for any. With quirky hour mark detail at 2, 3 & 4. Bold, rebellious and never shy, Diesel doesn’t follow trends; it creates them, preferring to blaze new ground. 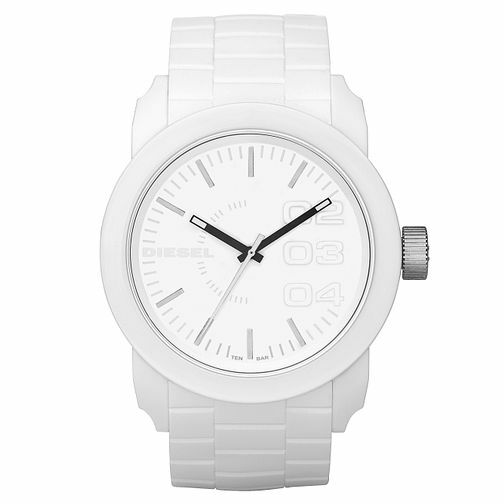 Diesel Double Down Men's White Silicone Strap Watch is rated 3.5 out of 5 by 2. Rated 2 out of 5 by Anonymous from Good look, terrible quality The watch looks great but the strap is terrible. I have had to have parts replaced 3 times and now the whole strap has gone. Really poor quality silicone.